Latest Update : Last Date Extended for Online application for this HMAT principal post. The New Last Date is 6th January 2018 !! The date for online application and to pay the challan is postponed. 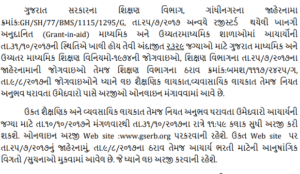 The new date for this GSERB Acharya or principal bharti is given in below image. The Gujarat State Education Recruitment Board abbreviated as GSERB conducts exams every year for various posts in the schools of Gujarat round the clock. The schools which are private in nature can register themselves under this GSERB bharti if they wish to get resources for their teaching positions in their schools. What are the various posts which are put up in the website of GSERB.ORG? Eligibility Criteria for GSERB Principal: Candidate should have passed TAT/HMAT Examination With higher marks. Educational Qualification: Candidates should have passed Graduation Degree and Post Graduation Degree in relevant stream from a recognized university. Also Candidate should have passed TAT/HMAT Examination With higher marks. How to Apply: Interested and eligible candidates may apply online through GSERB website – http://gserb.org/ – from 10-10-2017 to 06-01-2018. The GSERB principal Bharti’s application form goes live from October 10th of 2017. There are more than 2500 vacancies which are released for the post of principal in government, government aided and the private schools alike. The person who is applying for the post of principal under the GSERB Bharti must possess at least a UG degree with a compulsory degree in education like B.Ed. But most of the principal posts demand the following qualification from the candidates. Minimum two years of work experience. The candidates who fit in the above qualifications can make their application by following the processes of application mentioned under the how to apply title. To know other details like age limits, salary one has to log into the website of GSERB and check the official notification. The final selection of candidates is based on the interview conducted after the basic rounds of writing, checking skills of analysis etc. How to apply for GSERB principal recruitment? For all the posts which are put up in the website, the process of application is the same. Under the link which says GSERB Recruitment, if one makes a click, according to the post selected he/she will be directed to a new webpage. The new webpage has the notification and also the official advertisement which was released by the gserb.org. One must read the notification clearly and carefully to see if they fit themselves into all the terms and conditions. The notification carries details like Education Qualification, Age limits and other details which varies according to the posts. The certificates uploading will vary for each and every post as some posts might require just a 10th qualification, some might require a 12th, few under graduation, few post-graduations. The scanning and uploading of certificate is a very important process and should be done with utmost care. Some certificates’ might require an attestation from any higher authority and that should be done properly. After the uploading of the required documents like Aadhar card for proof of address and nationality, birth certificate etc. One should give a re-check. The certificates and the documents when scanned and kept ready before one begins to fill in the application form will be an easy application process for the candidates who are willing to join principal recruitment 2017 – 18. The passport size photo and the signature of the candidate must be scanned and uploaded. Many candidates feel that this process is quite tough as the websites throws a pop-up like the size of the document exceeds the mentioned size. In that cases, there are many websites online that helps one to compress the file size and to convert the format to the kind mentioned in the website. This can be kept in mind while a person faces trouble during this stage of filling in the application form. Once the submit button is clicked, the person is redirected to the payment page where he/she can choose the mode of payment preferred for the payment of the application forms. One has to stay careful and wide awake during this process as a refresh or a back option can disrupt the entire transaction process and one has nothing to worry about if he/she makes some error during the transaction process as all the other details filled in before the payment section are saved and the application form ID and the password is sent to the registered mail id and mobile number. Once all these processes get completed, one can go ahead with the downloading of the application form to save a copy for future use as the application id and password are the ones which is used to download the admit card for the exam. The entire school’s administration is vested in the hands of the principal under whom headmasters work. So, the principal can be claimed to be the topmost authority of a school. Therefore, a person who has prior experience as a teacher will do more justice to the role as he/she has to manage hundreds and hundreds of teachers who are working under them. The Ojas GSERB drive makes sure that they recruit the right kind of candidates who are fit enough physically, mentally and emotionally that the entire responsibly of the proper functioning of the school is in the hands of the principal. Coz a principal apart from managing and administering the school’s functions has to constantly think about bringing in innovative teaching methods and modern amenities in the school campus that will foster the student’s growth and helps them in the betterment of studies and a prosperous career ahead. 1.0.1 What are the various posts which are put up in the website of GSERB.ORG? 1.2 How to apply for GSERB principal recruitment?